Francisco Ventura AKA Lumber Jack has been working in the underground circuit of Mexico City for over 12 years, working on a DJ style that feels somehow familiar and unusual at the same time. He’s part of Ext. crew alongside Gabo Barranco (AAAA), this party seeks for the freshest sounds and shares them with its somehow reduced but very demanding crowd. 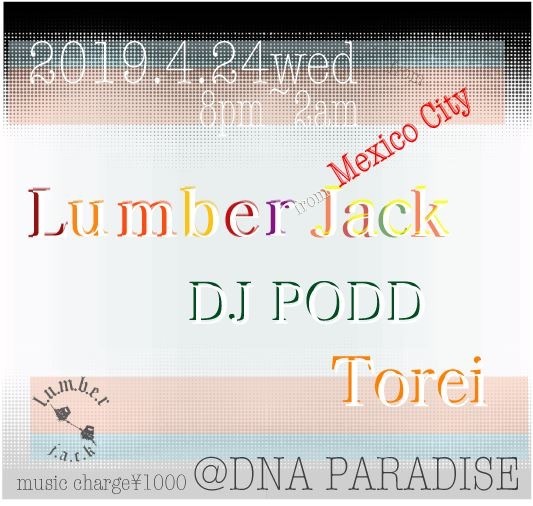 He’s also a resident DJ at Japan CDMX club with his monthly Heat Wave night. His DJ career spans throughout festivals such as Fascinoma, the Social and Apparitions, as well as headlining at venues like the Video Club in Bogotá, Bar Américas in Guadalajara, Corsica Studios in London, Forestlimit in Tokyo, the Astron Bar in Athens, and many more. Checkout his live recordings at the Boiler Room, Operator Radio or the legendary Panama Racing Club to get a taste and let yourself go with his irregular but remarkably danceable rhythms. For the next 3 hours live from Operator: Frankie Francisco from DANCE YOUR NAME Mexico and Marsman. Go to operator-radio.com or download our APP for better sound quality. Enjoy! COPYRIGHT© DNA PARADISE KYOTO ALL RIGHTS RESERVED.